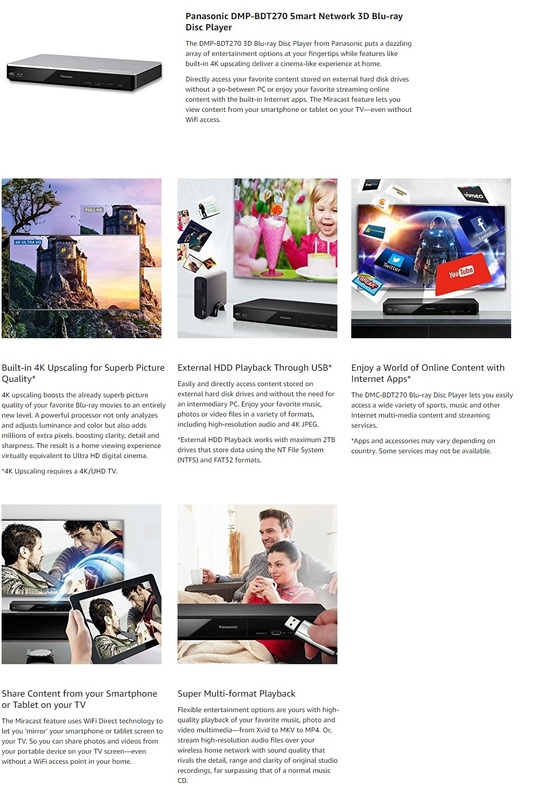 The BDT270 features 4K upscaling, Internet Apps and External HDD Playback while playing a FULL HD 3D Blu-ray Disc. And you can share content with other people by displaying it on a large-screen TV. This function instantaneously analyzes and compensates the luminance and color signals for each pixel in the output signal from Full-HD Blu-ray Disc media. It also up converts the input signal to 4K video signal (8M pixels) for improved resolution and richer textural expression. You can enjoy movies at home with a level of image quality that is virtually equivalent to that in a digital cinema.